Enjoy making baby sweaters, dresses and more! There might be nothing more satisfying than making crochet baby clothes. The little darlings work up super quickly in comparison with making items for adults, which is certainly satisfying. Parents (or charities) are always happy to receive a special handmade gift from a crafter. And every single thing you make is going to look cute, even if you have made an error or two in the crafting, because the baby makes the clothes adorable. You can make clothes that cover baby from head to toe ... and once you start, you may find that you never want to stop crocheting baby clothes! Here are some free crochet baby clothes patterns to get you started on that path! This is a sweet and simple free crochet sweater pattern that is worked in single crochet stitch. It uses contrasting yarn as an edging to make a bit more of an impact in terms of the design but it's still a really easy baby crochet clothing pattern to make. 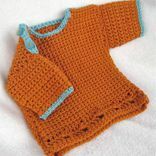 If you've never crocheted a baby sweater - or for that matter, any sweater - this pattern is a great place to start. Along with the free crochet pattern, designer Erica has posted a step by step tutorial for finishing the sweater, that walks you through the entire construction process. This cute little sweater is part of a coordinating baby layette set which also includes shoes, two hats and a blanket. People who want to make gifts for new babies will find that this is a great pattern to keep as a go-to design. And if you're a little late in getting baby's first sweater made; that's okay, because this pattern is written for five sixes from newborn through one year of age. This warm, cozy cardigan is really easy to crochet. The design is simple enough that this cardi would be fine as a first crochet project, which isn't true of many sweater patterns. Part of the ease comes from the fact that this crochet cardigan is worked using the simple single crochet stitch. Part of the ease is because of the simple design of the cardigan's shaping. Even though it's easy, it looks sophisticated, so you will be proud to have your baby wear it or to gift it to another child's mother. People who love to make crochet cardigans and sweaters for baby will want to check out this roundup of 15 free baby sweater crochet patterns. Crochet baby dresses might be even more popular to craft than sweaters for babies. This adorable dress from Creative Threads By Leah incorporates a solid top with a beautiful shell stitch. It is worked in a semi-ombre of three colors and includes the matching crochet pattern for a baby bonnet. Easy and adorable! The Knitting Scientist has made excellent use of the variegated colors in a bamboo/ cotton blend yarn in designing this crochet sundress pattern. It is a fun dress that will make baby standout and will make mom smile. It is sized up to age six months. How cute are these crochet baby pants with suspenders? Adorable! The contrasting color at the waist and leg hem of the pants gives a bit of pizazz to an already fun design. Intended for baby boys, these knickers would look cute on any child! This pattern by YARNutopia incorporates single and double crochet stitches along with post stitches. There are written instructions as well as a video tutorial to help you in crafting this cute set of pants! Crochet clothing for babies is always fun to make, but you can also get a lot of satisfaction from making baby accessories. Make sure to check out the patterns for baby hats, baby bibs and baby booties, too!